Fifty pilots and their crew will make their way to Howell, MI this weekend for the 26th Annual Michigan Challenge. The city wide summer celebration will feature basketball tounaments, frisbee dogs, bands, fireworks, stunt kites, skydivers, and a carnival. The entire community comes out to support the event and to welcome the balloonists. The focus on the balloon side of the event is definitely on the competition. The organizers and officials have committed to run a quality competition that is challenging for pilots and engaging for crowds. This commitment is refreshing for pilots who often deal with events struggling with their competition identity. Over the years the town has become very balloon savvy and they show their support by showing up for every flight. Large, knowledgeable crowds await the pilots at the targets in the mornings and an estimated 20,000 people (see pic below) will be on hand for the show Saturday night. All these things together attract a very strong field including 2009 Nationals top ten finishers Steve King, Tom Roush, and Paul Petrehn; along with 2010 event winners Jeff Pestun, Larry Coan, and Joe Zvada. The first of three comp flights will begin Saturday morning. Follow live on Twitter and here on the web as soon as possible after the flight. After a successful fun flight and fireworks Friday evening in Howell, MI the event was forced to cancel Saturday morning's scheduled competition flight due to rain in the area. They'll regroup and try again this afternoon. 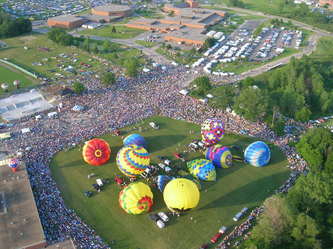 Pilots took to the air in front of a large crowd tonight in Howell. The task was a MJDG with three options for pilots to choose from. Shifting winds made the timing of the launch crucial for a good result. Despite the unpredictable weather, there were several close results. The top three: Chuck Walz (2.29m) Shawn Raya (5.15m) Rick Kerber (6.04m). The rest of the scores are below. Thick fog this morning led to the cancellation of the final flight. There was a slight change to the scores. They are posted below. Congrats to your winner Chuck Walz!